Before I begin... here is the Summer BBQ menu at Marie Callender's, oh and I have to note -- *PIE*. You receive a slice of pie with every entree! Choose from delicious BBQ entrées starting at $9.99 plus tax available through September 26. Each comes with a free slice of Marie’s legendary pie. Dry-rubbed and slow-roasted turkey breast, thinly shaved and topped with BBQ sauce topped with coleslaw on mini ciabatta rolls and served with fries. Crisp lettuce with tomatoes, jack and cheddar cheese, chopped hard-boiled egg, red onion and croutons tossed in tangy ranch and topped with gorgonzola cheese, slow-roasted tri-tip and BBQ sauce. 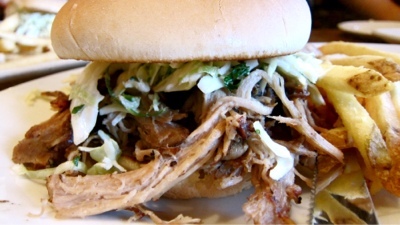 Tender, slow-cooked pork in BBQ sauce with coleslaw on a toasted bun served with fries. Available through September 26 for $15.99, Build-Your-Own BBQ Platter offers guests a variety of meat choices, sides and a slice of Marie’s famous pie! * Excludes cheesecakes, seasonal fresh fruit pies and promotional pies. 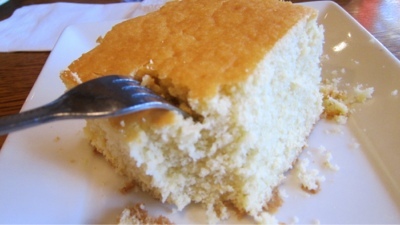 Started off with their house corn bread. Can't go wrong there. Buttery, moist and delicious. The BYOBBQ (see what I did there?) 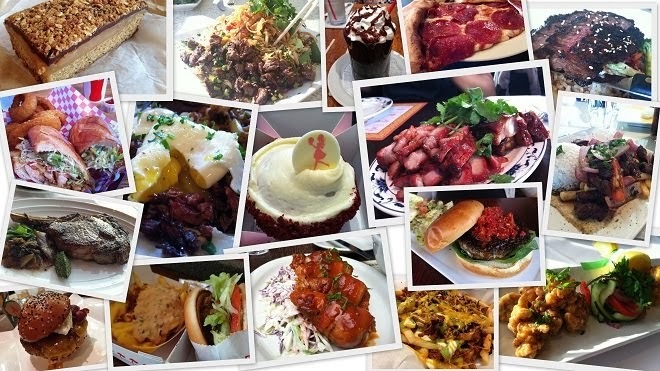 Platter ($15.99) offers guests a variety of meat choices, sides and a slice of Marie’s famous pie! I chose the slow roasted and hand-carved tri-tip and St. Louis BBQ ribs with the potato salad and southern-style mac n' cheese with ham and applewood smoked bacon as sides (that was a mouthful, YUM). The tri-tip was a bit on the drier side. Flavor factor was all there, but I wish the meat would have been served warmer. The BBQ ribs were just okay, as the mac n' cheese and potato salad took the throne for this dish. The mac n' cheese was rich and creamy with the perfect amount of saltiness from the ham and applewood smoked bacon. Wish they served it as an entree. Salivating yet? These BBQ Turkey Sliders ($9.99) will do the trick. 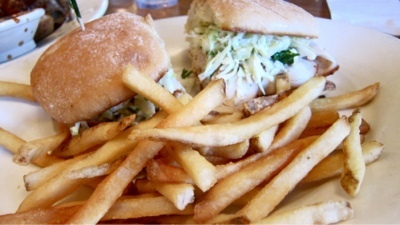 Guests receive two hefty-portioned (see pic below) dry-rubbed and slow-roasted turkey breast, thinly shaved and topped with BBQ sauce and cole slaw served on mini ciabatta rolls served with a side of delicious fries. The combination of the cold turkey (which was well-seasoned) and cole slaw was refreshing and perfect for a hot summer day. The cole slaw wasn't too sweet which is a good thing in my book. The slaw was cruuuuuunchy, just the way I like it. I've never had sliders that were served on ciabatta rolls but it worked. Let's not forget about the fries. They were SO GOOD. The Pulled Pork Sandwich is mounted with tender, slow-cooked pork in BBQ sauce with coleslaw on a toasted bun served with fries (gasp). All THIS for $10.99. Again, the pulled pork was on the drier side. I wish there was a bit more BBQ sauce on the sandwich also.... I love sauce, and there wasn't enough of it. Essentially, this tasted exactly like the turkey slider. If I didn't have room for dessert, I'd be a disgrace. 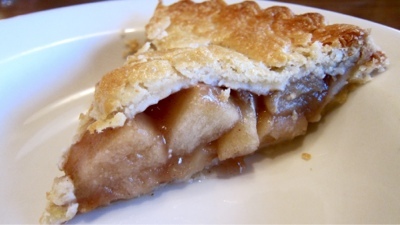 The classic, simple, can-never-go-wrong choice of all pies: THE APPLE PIE. Voila! Okay, okay. I'll spill the beans. I shared all the meals with my sister. It would have been quite impressive (depending on how you categorize near-death-experiences) if I were to have all this to myself. Each platter and entree comes with a slice of free pie but we asked our server for just two, instead of three. Welp, this wraps up my summer BBQ series experience at MC so now it's your turn to go out and try these dishes for yourself for a limited time (until September 26) at your local Marie Callender's! Happy summer and happy eatings, ya'll. 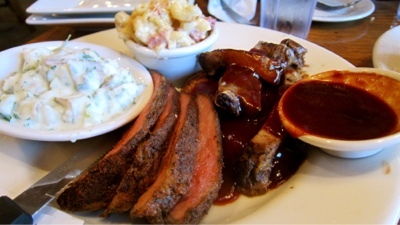 Disclaimer: Janice received complimentary gift cards to Marie Callender's to try out their Summer BBQ menu. A huge thank you to Marie Callender's and Murphy O'Brien Public Relations. The opinions expressed in this blog post are my own. Woodstock's Pizza. It reminds me of my college days. Back in the day, like in the 90's, Woodstock's used to be located right before Montezuma Road and El Cajon Boulevard met near this old apartment complex where my old college buddies used to live. This location is still on El Cajon Boulevard, but located in the Vons Shopping Center right off of College Avenue. They have been here a quite a while, but it is seriously the first time I have visited this location ever. 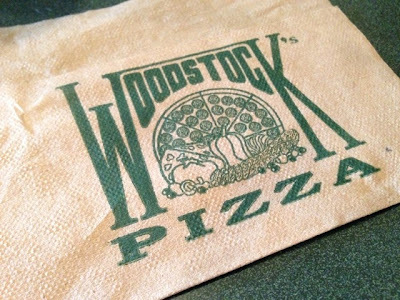 Our friend, M, who now lives in Hawaii, visited for the weekend and wanted to reminisce about the ol' good days and having lunch at Woodstock's. We met here on a weekday afternoon right before noon. I have noticed their lunch specials before on their outside window and I think it's a pretty darn good deal when you just want slices of delicious pizza pie. I took advantage of their 2 Slices & a Bottomless Soda for $4.99. Yum! 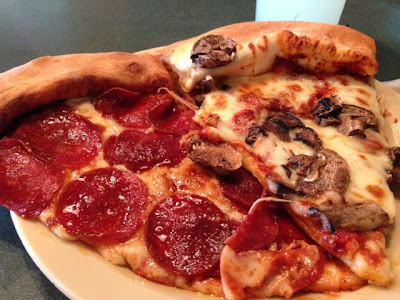 The slices they had available this afternoon were: pepperoni, hawaiian, cheese, and mushroom. 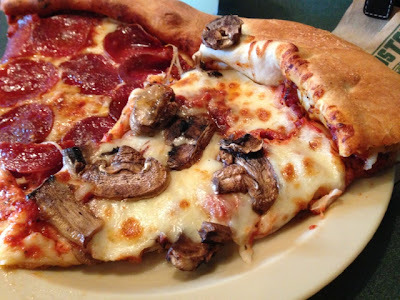 I selected my 'go-to' flavors -- pepperoni and mushroom, especially when they are together on one pizza. The slices were fairly large, almost covering half of the plate. Ohhhh.... pizza is so sinful. I used to consider pizza a snack because I get tired of the flavor fairly quickly. However, I kept eating... and eating and eating. The cheese was so gooey and melty. There were many slices of meaty pepperoni on my slice that every bite I took had a piece. Yum! 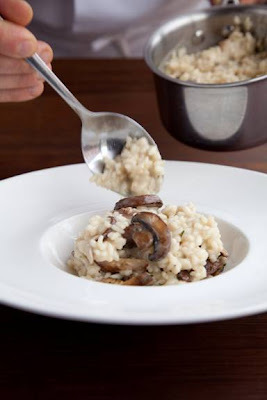 I ate really fast and I had to rest before I started on the mushroom slice. The mushroom slice had a lot of cheese and a fairly good amount of mushrooms. While this one was very good, I was STUFFED after a couple of bites. 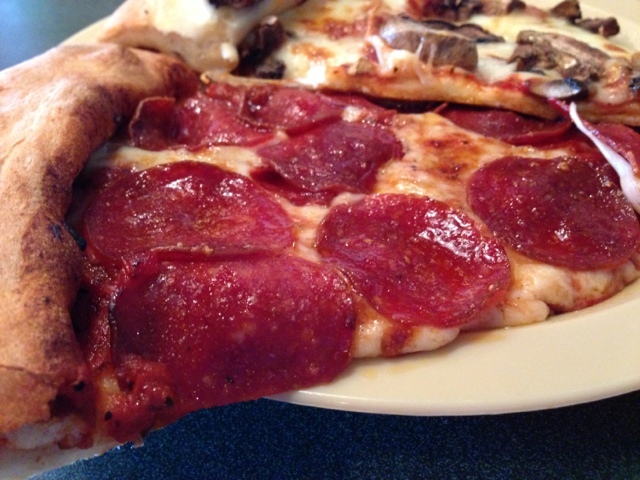 Two slices for me -- here at Woodstock's -- is more than enough. 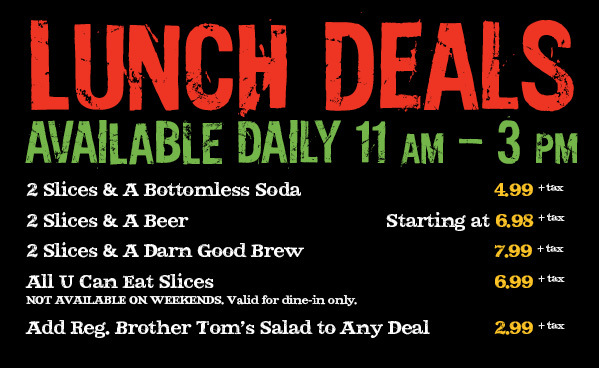 Here's a tip: This deal would be GREAT for sharing with another person and then ordering something else, like wings and/or a salad. M also got the 8 inch Wildebread ($4.49) and an antipasto salad ($5.29, not shown). 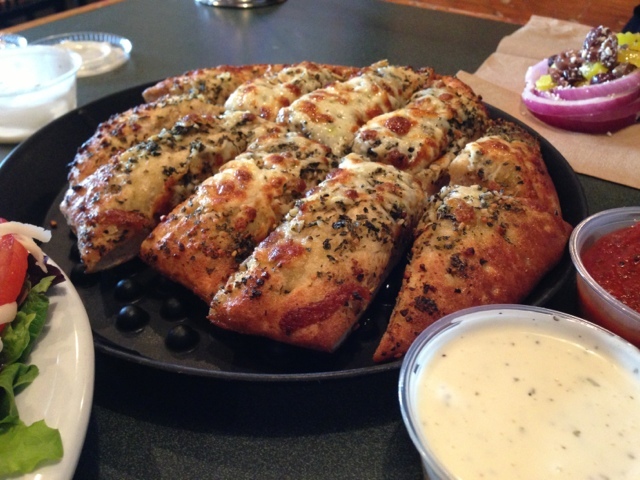 The bread is deliciously baked with herbs and garlic. It is served with creamy ranch and a marinara sauce. 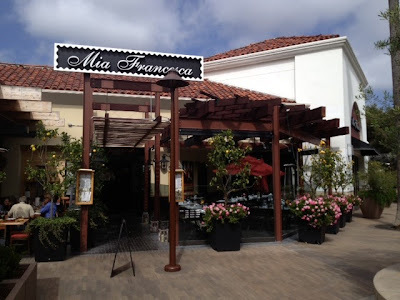 Th next time I visit, I will probably indulge in just one slice of pizza and order a side salad (ranges from $3.29 to $6.29 for a regular size). If you're going to order a specialty pie, I love the Monty's Revenge (pepperoni, sausage, peppers, onions, mushrooms and extra cheese) and the Garlic Bird (grilled chicken, creamy garlic sauce, onions, mushrooms and tomatoes). I will always associate Woodstock's with my college days. I am glad it is still around!